More than pitcher plants, my favourite bog/fen plant has to be the sundew. I could see them every time I visit a bog and still exclaim, “Oh look! A sundew!” My hiking companions would probably grow tired of hearing that from me. I’m not sure what it is about them that captivates me so – perhaps it’s a combination of their unusual ecology and their delicate appearance. Whatever the reason, when I walked down to the water’s edge a few weeks ago to look for the pitcher plants, I was also on the lookout for sundews. From the shore, however, I didn’t spot any. That didn’t surprise me too much – they’re small plants, and it would be easy enough to overlook them. Indeed, it was only as I was finishing taking photos of the pitcher plant from the canoe that I happened to spot immediately behind it a sundew, not six inches away, and I hadn’t even noticed it. Then I spotted another. And a third. 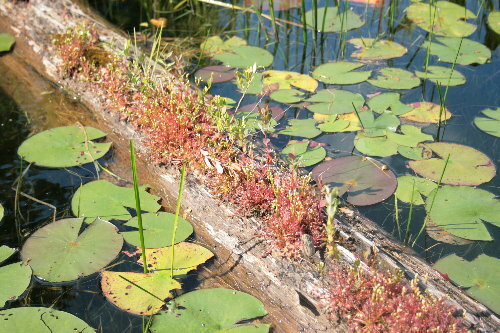 And then the raft of peat that I’d thought was covered in reddish moss resolved into a whole mass of sundews. As did the red cover on the floating logs. They were everywhere. How had I missed them? Of course, I took lots of photos once I spotted them, but I found them harder to get good images of than the pitcher plants, because their many spindly arms and delicate features were hard to focus on. There are seven species of sundew native to North America. Of these, three occur in Ontario. I believe this one is Spatulate-leaved Sundew, Drosera intermedia. 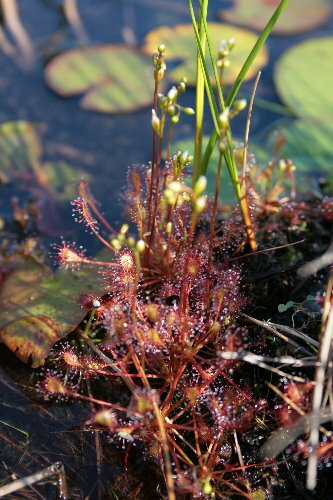 The leaves of this species are more oblong in shape, while a similar species, Round-leaved Sundew, Drosera rotundifolia, are, unsurprisingly, round. 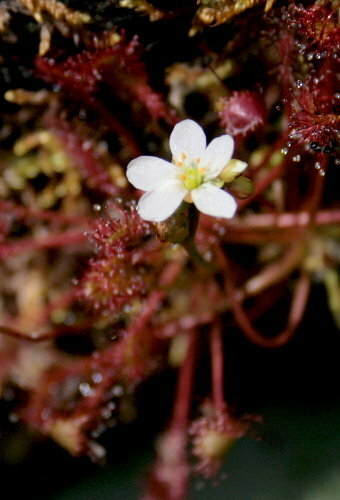 The third species, Linear-leaved Sundew, Drosera linearis, has long, narrow leaves. Spatulate-leaved Sundew has a very wide range, growing through eastern North America, northern South America, and much of Europe. Each leaf has many thin tentacles that are tipped in a glassy bead of moisture. These beads resemble dewdrops, and give the group their common name (sundew) and generic name (Drosera, from the greek “drosos”, meaning “dewdrops”). 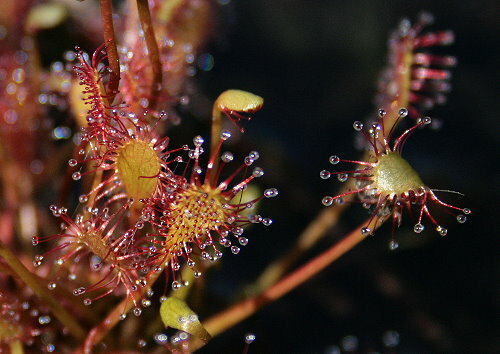 However, while dewdrops are simply water, the beads on a sundew are a more sticky substance produced by the plant. The tip of each stalk has a gland that secretes a sweet mucus that forms the glittery beads of dew. This mucus contains enzymes that are used to trap and subsequently break down prey that are attracted to the sweet secretions. The broad part of each leaf also contains glands that help absorb the nutrients released by the enzymes in the mucus. Like the open pad of a Venus Flytrap that “snaps” shut when prey lands on it, the tentacles on each sundew leaf have the ability to curve toward potential prey when the “sensors” of a tentacle are triggered. In some species this response can be relatively quick, with the fastest being D. capensis of South Africa, which can completely enclose its prey in 30 minutes. This poor damselfly had the misfortune of landing on the sundew, and is now halfway through becoming the sundew’s lunch. 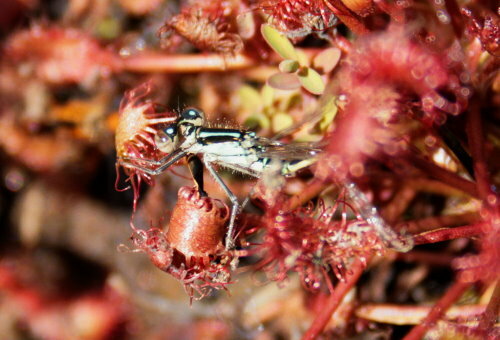 You can see how the leaves and tentacles of the sundew have completely wrapped around the damsel’s legs, and have bent around to further entangle the head. It’s to the plant’s advantage to bring as many tentacles (and their digestive glands) into contact with the prey as possible, since it makes digestion easier and faster. I’ve called it the plant that eats meat, rather than the pitcher plant which I said drinks meat, because the sundew absorbs its meal without the benefit of the liquidy brew that the pitcher plant disolves its prey in. Most of the sundews had flower stalks up, but very few were actually blooming. Dan was kind enough to hold the boat in place as we were leaving the site so that I could snap this photo when I happened to spot one with an open flower. As with the pitcher plant, the flowers are generally held on long stalks, well above the carnivorous part of the plant, to increase visibility and keep pollinators away from the danger zone. Each flower may only last a short while, and have the ability to self-pollinate if they don’t receive pollen from another flower. Interestingly, they are able to move to follow the path of the sun over the course of the day. Although they look plain white to us, perhaps there is a UV-reflective pattern on the petals that is best illuminated (to the eyes of insects) when in full sunlight. Nice post, lovely pictures. I love sundew too. I can only remember coming across it once, but have probably missed it other times. I’m embarrassed to admit I didn’t know that there were more than one species of sundew. You’re right, they are good at flying below the radar, and even when spotted, look so dainty that it’s hard to believe they do what they do. Pitcher plants, by contrast, look like great open gullets, and one suspects foul play immediately. Don’t worry, Dave, neither did I till I looked it up! They’re pretty amazing little plants. Stunning photos of these tiny plants! Sundew is much more common than most people realize, it is very small so often goes unnoticed. Thanks, Bill! I agree that probably many people have seen sundew and haven’t realized it. Like I noted in the post, from a distance it just looks like a red mossy carpet. these are wonderful photos, sundews are beautiful and fascinating plants….